You know the names and maybe even the places - England has Glastonbury and Download, Germany has Wacken Open Air, California has Coachella and Chicago has Lollapalooza (not to mention literally dozens and dozens of other great music festivals across the globe). 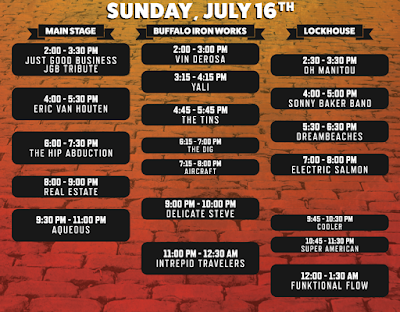 And now Buffalo has Cobblestone Live! Music and Arts Festival, which could soon become the Queen City’s signature music fest, a welcome addition to our summer’s already jam packed outdoor event schedule. The inaugural Cobblestone Live! 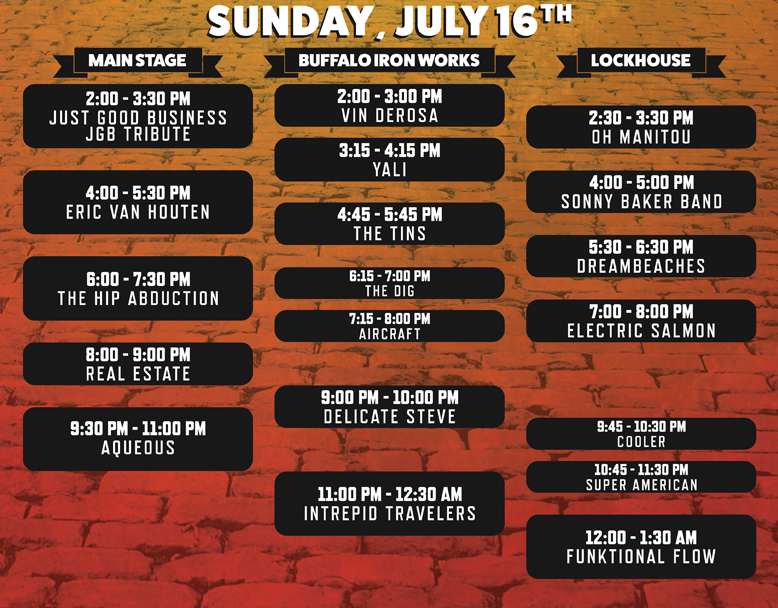 Music and Arts Festival, located in the heart of the Historic Cobblestone district in downtown Buffalo, on July 15 and 16, is brought to all of us by Buffalo Iron Works, Lockhouse Distillery and Sunbeam Entertainment. A portion of all proceeds from the fest will go directly to benefit Planned Parenthood (find ticket info below). While Western New York has endless summer concert series, Kiss the Summer Hello, Kerfuffle and so on and so forth, Cobblestone Live! presents something different and something so inherently Buffalo. “It's true that a lot of successful festivals have a very narrow focus, but this festival is particular to Buffalo, it's reflective of the community that is producing it. And Buffalo has eclectic taste. When we put our heads together, we wanted to come up with a lineup that offers a little something for everyone, that covers a lot of ground,” he adds. 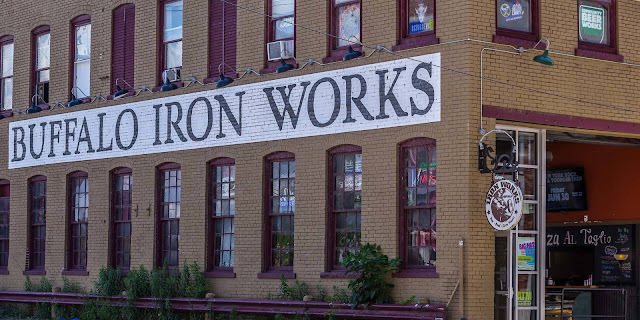 The first annual music and arts festival will feature three stages - one located outside on Illinois Street, one inside Iron Works and one inside Lockhouse. 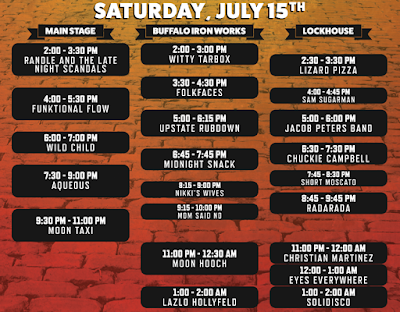 Music enthusiasts can eat, drink and consume the best that Buffalo has to offer, all while enjoying sounds from acts such as Moon Taxi, Real Estate, Aqueous, Moon Hooch, The Hip Abduction, Solidisco, Wild Child, The Dig, Delicate Steve, Funktional Flow & more. In addition to three stages featuring over 35 artists/bands, there will be food trucks, beer tents, local vendors and outdoor activities so attendees can wander from stage to stage to get the full experience. 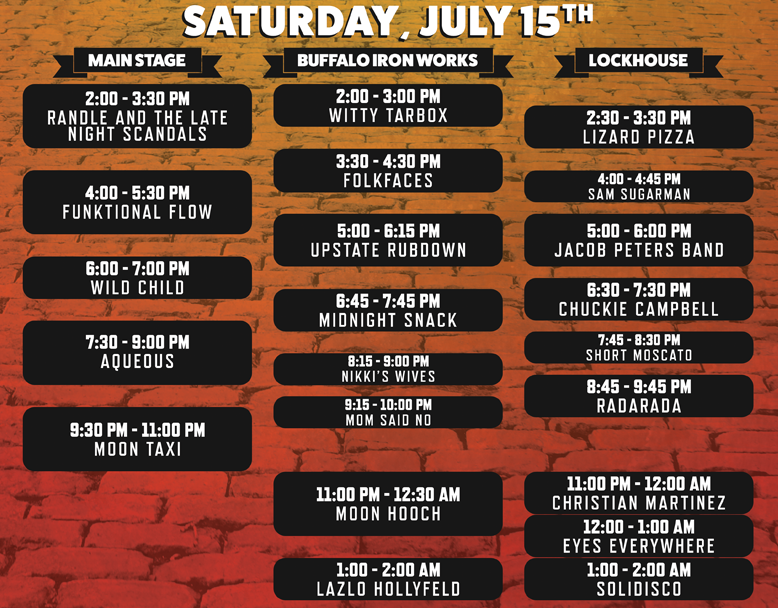 Gates open at 1pm and music starts at 2pm daily, and music at the outdoor mainstage will end at 11pm, with music continuing in Iron Works and Lockhouse until 2am. Perhaps the most unique aspect of Cobblestone Live! is that re-entry will be allowed, something mostly unheard of at music festivals, but hopefully will become a trend in the future. "With two days and nights of music spread across three stages, we realize that people might need to take a break, maybe stop back at home, or simply get a change of scenery," Holtzman says. "We want people to come for as short or as long of a period of time as they want to and are able to. We just want them to come." Tickets are still available - $25 day tickets / $45 two day pass / $100/$200 VIP levels – and can be purchased at www.cobblestonelive.com. VIP Level 1 include a Two Day Pass, access to VIP areas at Main Stage, Iron Works Stage & Lockhouse Stage, complimentary food at VIP tents, special merchandise items and collectible laminate from Cobblestone Live and more perks TBA and the VIP Level 2 includes all of that and a private Sunday brunch with live music from The Emporium (Mike & Dave of Aqueous) & Midnight Snack as well as a private open bar Happy Hour on Saturday.